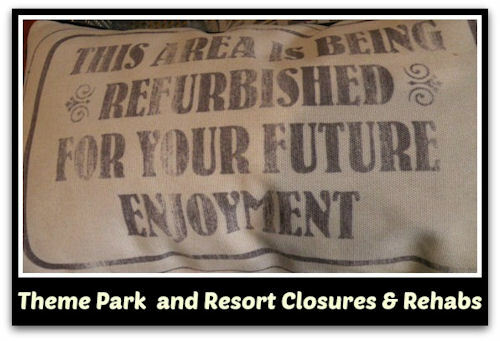 Not all Walt Disney World Theme Park and Resort Closures and Rehabs listed appear on Disney’s official rehab calendar. For updated information on attraction closings, call 407-W-DISNEY (934-7639) just prior to your scheduled visit. Schedules below are meant as an informative rather than official guide and are gathered from a number of official and unofficial sources. The Walt Disney World Railroad is closed until further notice as work is done on the Tron Coaster. The Tron-themed attraction similar to the roller coaster found at Shanghai Disneyland is coming to Tomorrowland and will be located in a new area near Space Mountain. The Tomorrowland Speedway is also closed through mid-May due to work on the upcoming coaster. The Tron-themed attraction is expected to open by 2021. Epcot will soon get a brand new E-ticket attraction within Future World based on the world of Guardians of the Galaxy. To make way for this new ride, Ellen’s Energy Adventure inside Universe of Energy closed on August 13, 2017. The new attraction will open by the 50th anniversary of Walt Disney World Resort in 2021. A new ride inspired by the film Ratatouille will be built in an all-new space in World Showcase’s France pavilion. The ride, called Remy’s Ratatouille Adventure, will take guests on a dazzling chase across a kitchen with the sights, sounds and smells of Gusteau’s Parisian restaurant. This new attraction will open by 2021. The China Pavilion will be getting a brand new Circle-Vision show showcasing the majesty of China. This updated film will be added using a next-generation digital camera system to film a brand new, seamless projection show. The Canada Pavilion will be getting a brand new Circle-Vision show showcasing the majesty of Canada. This updated film will be added using a next-generation digital camera system to film a brand new, seamless projection show. A new game-changing attraction called Mickey and Minnie’s Runaway Railway will open in the fall of 2019. It will feature an original story that will take guests on a journey inside the world of Disney Channel’s “Mickey Mouse” cartoon shorts and will utilize new technologies that will turn the flat cartoon world into an incredible dimensional display. This attraction will be located inside the Chinese Theatre and will replace The Great Movie Ride. The Great Movie Ride closed on August 13, 2017. A Star Wars-themed Land called Star Wars: Galaxy’s Edge will be coming to Disney’s Hollywood Studios, allowing Star Wars fans to step into the stories from a galaxy far, far away. Plans to bring Star Wars to life include creating Disney’s largest single-themed land expansions ever at 14-acres. This authentic land will have two signature attractions that will transported guests to a never-before-seen planet with experiences including a customized secret mission on the Millennium Falcon and an epic Star Wars adventure that puts guests in the middle of a climactic battle. The Star Wars-themed land is expected to open on August 29, 2019. Rafiki’s Planet Watch, including the Affection Section, Conservation Station, and the Wildlife Express Train will return later this summer. Cirque du Soleil La Nouba has closed permanently. Cirque du Soleil and Walt Disney World are working together on a new project that will entertain many more Guests in the future. The new show will draw its inspiration from Disney’s heritage of animation. It will celebrate Disney’s legacy of storytelling in Cirque du Soleil’s signature way, with a tribute to the one-of a kind craftsmanship that makes Disney so extraordinary. DisneyQuest indoor interactive theme park has closed to make way for the NBA Experience. The NBA Experience will be an expansive, one-of-a-kind destination will feature hands-on activities that put families and guests of all ages right in the middle of NBA game action. Guests will enjoy immersive NBA video productions and numerous interactive experiences, as well as a restaurant and a retail store. The NBA Experience is expected to open on August 12. Disney’s Caribbean Beach Resort is currently under refurbishment. Recently opened were a sit down restaurant, Sebastian’s Bistro; a quick service location, Centertown Market; a pool bar, Banana Cabana, and Calypso Trading Post. Additional work is being done around the resort to prepare for Disney Skyliner gondola system. Any work most likely to cause a noise impact will not begin until 9:00 a.m.
El Mercado de Coronado will see minor refurbishment work through the Summer of 2019. During this time, the quick-service restaurant will remain in operation. If Guests would like to experience one of the other dining locations, they can visit Maya Grill, Las Ventanas, Café Rix, Laguna Bar, Siestas Cantina and the newly reimagined space, Rix Sports Bar & Grill, featuring a variety of sandwiches, salads and refreshing beverages. All amenities will remain in operation, including the Dig Site pool area, La Vida Health Club, Salon & Spa and the Iguana Arcade. Disney’s Coronado Springs Resort will be transformed over the next two years. A new 15-story tower called Gran Destino Tower will be added with views overlooking beautiful Lago Dorado. There will be 500 more Guest rooms featuring suites and concierge level services, along with additional new features for Guests to enjoy, including a rooftop restaurant. The project will end in the summer of 2019. The Hippy Dippy Pool is scheduled to be closed for refurbishment January 2020-Early Spring 2020. During this time, Guests can use the Bowling Pool, Computer Pool and the kiddie pool. Also, Petals Pool Bar will be closed and Movies Under the Stars will be offered in an alternate location. Guests may notice construction noise while this refurbishment is underway, but the noise should not be heard from Guest rooms between dusk and 9:00 a.m.
Disney has announced its 15th Disney Vacation Club property called Disney’s Riviera Resort which will be located near Epcot. The resort will feature a rooftop restaurant that will have unbelievable views of the nighttime spectaculars at both Epcot and Disney’s Hollywood Studios. Disney announced that they will be building an immersive Star Wars-themed hotel that will be the most experiential concept ever. The hotel will be dedicated entirely to the galaxy of Star Wars, and guests will have a one-of-a-kind experience where a luxury resort meets a multi-day adventure in a galaxy far, far away. Disney has announced its 16th Disney Vacation Club property called Reflections – A Disney Lakeside Lodge which will be located in the former location of River Country between Disney’s Fort Wilderness Resort and Disney’s Wilderness Lodge. The resort will feature a nature-inspired design. Disney confirmed that they will be introducing a gondola transportation system called Disney Skyliner. This new transportation system will give guests a bird’s-eye view of the Walt Disney World Resort and will connect Epcot and Disney’s Hollywood Studios to four resorts – Disney’s Art of Animation Resort, Disney’s Pop Century Resort and Disney’s Caribbean Beach Resort, as well the upcoming Disney’s Riviera Resort.